1. Dash Charge feature is awesome. Its really fast. 10% to 80% is getting charged quickly after that it taking long time to fully charge. 2. It made with metal but it did&apos;t heats up while charging which is a good thing. Good job OnePlus. 4. If i about gaming then this is my first time when i play a high graphic games without lag. If you are gamer then it is best for you. 5. If you want to know about RAM then i want to say this make your phone better. I have seen some complaints about RAM management. But after the last update OnePlus able to solve it. 6. The color reproduction is great on 16MP primary camera. Front camera is also takes pretty good pictures. Both, indoor and outdoor pic is awesome. Pictures are better than any other phone in price segment. 1. If you want to take pictures with Single LED flash then it can not take that good quality. 2. The headphone jack gives me problems sometime. I bought this phone 2 months back and it was a big upgrade from the Nexus 5 I was previously using. Till now I haven&apos;t experienced any heating issues but some of my friends have reported that. It&apos;s really fast, 6GB RAM helps there. Decent camera - quality is much better than its peers in the same price range. Coming from a small sized Nexus 5, this phone feels very big. Doesn&apos;t fit properly in the pocket! It isn&apos;t very sturdy and slips from hands. The accessories are very costly. The screen protector I bought from official OnePlus store for Rs. 1,500 doesn&apos;t even fit properly. 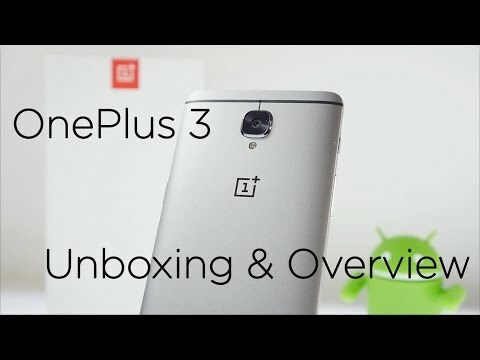 OnePlus 3 is overall a really good phone and probably the best for the price! It&apos;s very stylish and an absolute beast. The specs are on par with any top smartphone out there. Build quality looks premium. Camera is great but not the best in the world, but it will take great shots and videos. It has 6 GB of RAM, making it one of the only handsets to offer this and the performance is very smooth. From gaming to browsing apps and webpages , the OnePlus 3 handles everything pretty well. Battery life is great. The OnePlus 3 is easily the best phone especially if you consider the price. After using a Samsung Note 3 for a long time it had begun to lag, and hence one of the expectations from this phone was, it should be great at Multitasking. And, it does live upto it, maybe the 6GB RAM does its work. Also, what I first thought was a fancy feature, the Dash charging now seems to me like a necessary luxury. 0-60% in 30 minutes is a life saver. The fingerprint sensor is a cherry on the cake. :) The only problem I faced it was while getting it replaced from Amazon in exchange of a faulty phone, wish Amazon would have been cooperative with their service or better, would have been awesome if OnePlus would have been available on Flipkart. Anyways, the product is good and what I faced was a rare instance so it can be easily overlooked. One Plus 3 is simply awesome. This is the phone worth spending and was looking for a year to buy. Don&apos;t Compromise on your phone is rightly said and delivered by Oneplus. Whatever you ask for is available in oneplus3 . One thing that make this phone unique is it&apos;s camera, it&apos;s just awesome and can be compared to phones that cost more than 50 thousand and still you would be satisfied with this camera. The Metal Body and it&apos;s ultra thin design are cool and I loved it. It look like a flagship device and you will feel good while carrying on your hand. I would say if you want to buy this phone, then go for it without any second thought. 4. 64GB internal memory is sufficient. Best phone under 50k. Quite frankly a beast. 29 Pricebaba users have written their experience with OnePlus 3. If you own OnePlus 3, please do leave your feedback too. The OnePlus 3 follows the OnePlus 2, OnePlus X and the OnePlus One as the fourth major smartphone to be released by OnePlus. As expected from a OnePlus smartphone, the OnePlus 3 packs a powerful punch when it comes to specifications, while costing just a shade more than half of what a true flagship of 2016 like the Samsung Galaxy S7 or the LG G5 would cost. The OnePlus 3 was the first smartphone to launch with a “global VR shopping experience” as it was available exclusively via the Loop VR app. The OnePlus 3 comes with a premium build quality, very different from any that we have seen on any OnePlus device so far. While the OnePlus One and OnePlus 2 featured a sandstone back, the OnePlus 3 replaces it with a metallic back giving that extra bit of premium-ness. The front of the phone is dominated by a 5.5 inch Full HD display. The screen on the OnePlus 3 uses an Optic AMOLED display. The edges of the phone are nicely curved so that the phone does not feel sharp on the palm, a stark improvement from the OnePlus One and the OnePlus 2. The OnePlus 3 is powered by the latest flagship chipset from Qualcomm in the form of Snapdragon 820 chipset. The Snapdragon 820 chipset is coupled with a 6GB of RAM on board, to ensure a lightning fast performance from the device. In terms of features, the phone comes with a fingerprint scanner that is embedded in the home button of the phone. The fingerprint scanner claims to unlock your OnePlus 3 in less than .2 seconds. The phone in India will be shipped with introductory bundled offers with Saavn, Kindle as well as an option to pick an accidental warranty with the device. The OnePlus 3 also is the first smartphone from OnePlus that at launch will not be on an invite only model. The rear camera on the OnePlus 3 is a 16MP sensor with a single LED flash. The front facing snapper is a 8MP shooter that should suffice for the selfies and video chat requirements. The rear camera is capable of shooting videos in 4K and has OIS, so that the shots come out without any blur. The OnePlus 3 is available with a 64GB internal storage. There is no slot for a MicroSD card here, so you have what you have and cannot expand the memory. Although 64GB should be sufficient for most of the things you want to store, else you could always look at backing up your things on the cloud to make more storage space. The OnePlus 3 comes with a 3,000 mAh battery, which is non-removable. It comes with a quick charging technology that OnePlus is calling ‘Dash Charging’. On the connectivity front you have a Dual SIM card slot with Nano-SIM cards. This is not a hybrid SIM slot, so do not end up inserting your MicroSD card here. You have LTE support on both the SIM cards as well as the usual array of connectivity options including WiFi, Bluetooth, GPS and NFC. There is no radio here, though you will get a USB Type-C port for charging and syncing. The closest competition to OnePlus 3 comes from the Xiaomi Mi5 as both the phones are powered by Snapdragon 820. However, the Mi5 features a significantly lower RAM than the OnePlus 3. The LeEco Le Max 2 would be an interesting alternative to the OnePlus 3 too, if you are looking to pick a phone with strong specs at a reasonable price point. If not, all the flagship devices like the LG G5, Samsung Galaxy S7 and HTC 10 would make for good choices. 1. Does the OnePlus 3 work with Reliance Jio network? - OnePlus 3 supports 4G LTE on Indian bands with VoLTE feature enabling the user to use the device with Reliance Jio network. - No, OnePlus 3 has two dedicated SIM slots and lacks a MicroSD card slot limiting the user with 64GB onboard storage. - OnePlus 3 uses the latest USB Type-C port for charging and data syncing. The needed cable and charger are provided with the phone. - As mentioned above, the OnePlus 3 lacks storage expansion option. However, the internal 64GB of storage is sufficient for most with around 52.6GB of storage that is available for the user to install apps and store data. 5. How long would the battery last? Does is support fast charging? - The battery of the phone should last through the day for most with average usage. But even if you need to plug in the device before you your day off, the Dash Charge support of the OnePlus 3 is a life saver that charges the phone up to 60% in around half an hour. - No, the battery is sealed inside the phone and is not user removable. 7. Can it record Slo-mo and 4K videos? - Yes, the device can record both 4K as well as Slo-mo videos. - Box contents include OnePlus 3 handset, Dash wall charger, charging and data syncing USB Type-C cable and a SIM ejector pin. 9. How much time does OnePlus 3 take to charge?